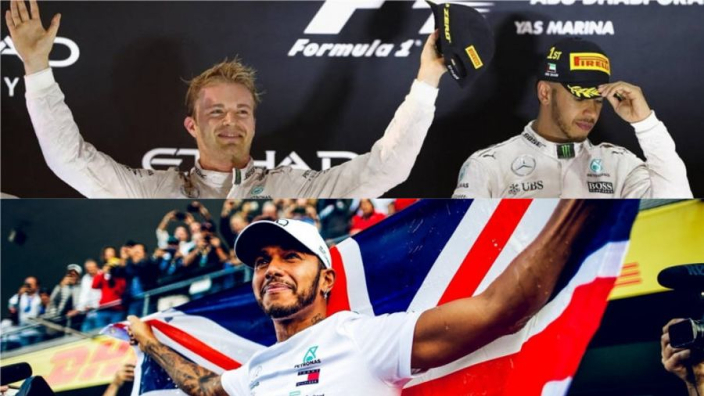 Lewis Hamilton has been inspired to "outclass" Sebastian Vettel over the past two Formula 1 seasons by the memory of losing out to Mercedes teammate Nico Rosberg in 216, according to Paddy Lowe. Poor fortune and Rosberg's career-defining season combined to deny Hamilton for the only time in the V6 Hybrid era. Hamilton has won the drivers' championship in four of the last five seasons, having wrapped up the 2018 championship in Mexico last weekend. Lowe was Mercedes' technical chief in the 2016 campaign, which saw Rosberg come out on top before retiring just five days after sealing his first world title. And Lowe believes the sting of that defeat has motivated Hamilton to put his foot down again in 2017 and 2018. "I think he's driven two terrific seasons," Lowe said. "Two of his strongest seasons of all these last two years. "The 2016 year was one he didn't win and he probably believes he could have won it so that was a good motivation for him to understand how to strengthen his game. And we've seen that the last two years. "He's become a very difficult driver to beat. "We've seen Sebastian has struggled to beat him this year. There have been losses in all sorts of different areas but even just as a driver matching, I think Lewis has outclassed Sebastian. "That's been one of the mismatches, there have been other mismatches in terms of the teamwork. One team has performed better than the other team top to bottom. But on top of it all is Lewis who's just a phenomenal driver."